PRINT takes place once every four years at McCormick Place in Chicago, IL. As the largest show in the US, it is a “must attend” for any business to learn about new technologies and advancements in the printing, packaging and graphic arts industry. This year Kluge will exhibit at booth #3412 our modular constructed OmniFold multi-function folder gluer. Our popular folder gluer will insert a product into a direct mail piece inline. Additionally, on our booth we will demonstrate the EHG half sheet foil stamping, embossing and diecutting press where we will finish a first of its kind, single-pass, foil stamping, embossing, diecutting and scoring piece. Yes, ONE PASS! Don’t miss it. As a key exhibitor at PRINT 09, we are offering our customers and connections the opportunity to register for the show at no cost. The process is simple, use the link below when registering for your tickets. By following this link and stepping through the registration screens you will receive your free admission – It’s that simple! 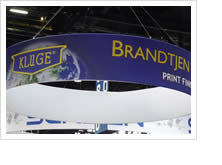 In the meantime, stay updated with our developments and learn about the print finishing industry at www.kluge.biz. We look forward to connecting with you at PRINT 09, booth #3412!